The story begins like this. No. It does not. There is no story. Or, they shoveled a load of speed and shuddered toward the coast. Saltpans. Sparse groupings of pine. Dust. A bar at the side of the road. A woman beneath a tattered palm of tarpaulin, cigarette and sunburnt fingers. Vegetables, assorted fruit in plastic buckets. Flies. He sat with the body for almost ten hours, watching the face almost imperceptibly flush back out. Day just breaking. Birds. The faint moan of trains. A small stain of wax on the wall. So, this is death, he thought. Late light in a just-turned summer streamed through the high canopy, just off the beach. The way the rocks went into the water. The way you could just fall off the side of the world. Digging in the red-dry dirt, fingers dry, air dry. Looking out at the other side of waves. Ruins of indeterminate origin. A face there, one face of many, what of it and why. Cicadas at night, their whirl and wind. Smoke on the edge. Maybe brush fires. A sudden light: a man, a pen-blue tattoo nailed to shoulder. He’d come up the beach alone, dangling low-volume static. Skin leathered from long exposure, a smell of sun, dried sweat, tobacco. They were back toward the road, he said. But not in the pines. Tuna straight from the tin, a bead of oil on a fingertip, almost cut on the lid, a roll of bread, Harissa. A can of beer. Two. No cars. No people. This is how the waiting begins, he thought. No wind. In certain parts of the city, when the sky begins to dusk, the crows turn the air into a latticework of wings and call. Five years, he hears, five years. And then one day awoke. The streets long. In that time when cities had already become like malls. Or simply were. The edge of fall. Below a building a small heap of clothes, wet with night. Beside them, brushed bronze and blaze, a square stone. They asked, So what did you do with your freedom? A kind of blackout, he said, I did what one does. I anesthetized it. That’s: me. Tubes along the roads like cannulae and a bridge named after a painter. Railways in morning’s ruddy light. Where once coin-driven cabins more new hotels. Walls of liquid crystal now, the modern city’s symbol still a wall, rooms constellated like stars across time and space, caesarean-scarred, ageless, in the end the money’s still the same. The cold silence of the stations like the ultimate one to come. Out at the city’s edges, night already close to frosting. The woods there, hiding, the rails, shivering. Granulated air. Brick. Cold water ripple, barbed-wire hand. A wonder we’re even here at all. Here is a list of colors for no one in particular. A list of days dissolving. What seest thou else in the dark backward and abyss of time? Over one thousand views of the moon. Obsession. A wall-and-mirror silhouette. Desk. Backpack. Rug. As if you might sneak out the window of your life, was it? Or call back up? And again under evening’s skinned-knee sky, flakes of light falling through all the in-betweens. The blue-hued whorls of the heart. Quiet again, the late day’s light mostly unseen from where he sits, brick once again halved into bright and dark, far sky paling out. Too many. And no talismans left. Auguries gone. But bells again. And blue. Another day fading. Where did they all go so soon? Inner courtyard blank. Windows blank. A light goes on in the stairwell but no one moves. A collection of postcards on a windowsill. Here is a border. Beyond this point. Countries disappearing. Exile’s bottle of despair. Blake’s death mask by Bacon. Dutch still-life. A room of wax. A river. Expulsion. A collection of snapshots to the side. Coming back across a border the inner border what is an inner border he had no idea and from where it was he came little either now. The jacket your father gave you no longer fits. Around the corner there, the lights would of course be on, as would the gloom, the dark neon of neverending night. A distant story, but recurrent. It would be one of escape. And names in dust on windowframes. Behind the bar in an abandoned mining town a man pointed to a row of teeth in a glass beneath the backlit bottles. My collateral, he said, and laughed. Isolated detail an impossible question. Sparse groupings of different pine. Later, blackdraped groups winding their way through a sooted and muddy wail of land. Author’s note: (It. ): shrapnel; shard. 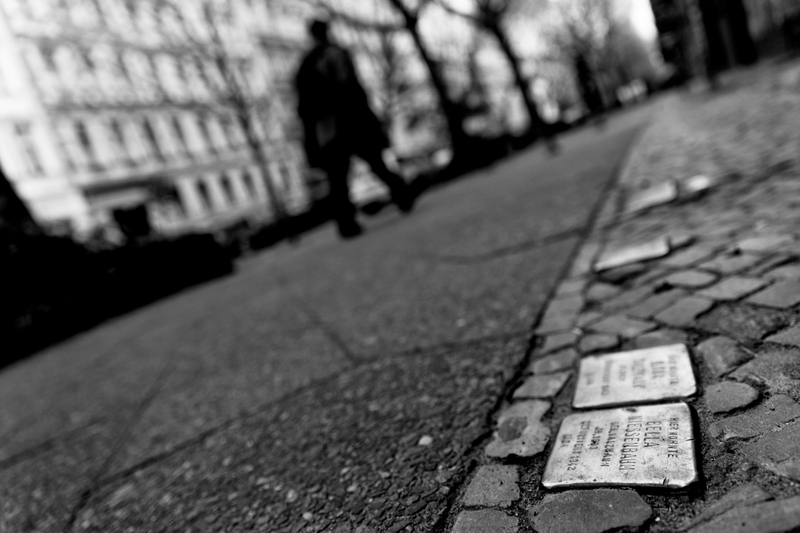 “brushed bronze and blaze, a square stone”: Stolpersteine (Ger.) lit. stumbling stones. “What seest thou else in the dark backward and abyss of time?”: William Shakespeare, The Tempest. 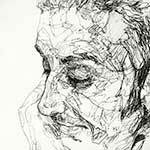 “In isolation, a puzzle piece means nothing – just an impossible question”: Georges Perec, Life: A User’s Manual. Thalassa (Gk. ): “Thalatta! Thalatta!” (The sea! The sea!) Xenophon, Anabasis. “Out on the plain . . .”: Francisco Goya: Fight with Cudgels, A Pilgrimage to San Isidro. Alexander Booth (www.wordkunst.com) is a poet and literary translator. A recipient of a PEN/Heim Translation Fund grant for his translations of German poet Lutz Seiler, in field latin (Seagull Books, 2016), his poetry and translations have appeared in numerous international print and online journals. After many years in Rome, he currently lives in Berlin.